1. Emerges from the collective unconscious of a tribe or Folk. 2. Is not "for all mankind" nor for the "salvation of all men, everywhere". 3. Allows that other paths are right for other peoples, hence the "9 Worlds" of Norse Theology, the various different Gods or Goddesses who visit the councils of one's own Gods in other indigenous theologies, such as Greek or some Amerindian ones. 4. Recognizes that other peoples have other Gods or Goddesses and, as in areas in ancient Europe where there were Druids, Wiccans, and Oðinists in the same area, does not require wars of religious conquest to validate subscription to the faith. 5. It allows that there are actions that men, themselves, can take to alter their outcomes, and does not require a godly sacrifice to achieve this, nor the forced conversion of any others. 6. Allows that, these are not linear nor fixed like a court sentence. Hence, we understand that Ørlag is like karma-vipaka, but unlike the sin/forgiveness cycles of other peoples. Our past-lives actions and tendencies do carry over, but we can change them and are not bound by them. 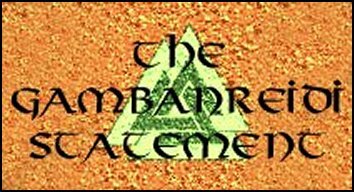 We do not answer for "sins" to "cosmic discliplinarian" nor apologize for imaginary infractions or for the violation of Hebraic tribal laws and customs. As Oðinists, we accept our part in the cosmic drama of upward evolutionary spiral and work toward our own transformation away from pettiness of spirit, being tied to hoarding, owning, and other false measures of self-worth, and work toward the preservation of the planet and its diversity. We work toward our own evolution . . . toward the state of konr, as hinted at in Rígsþula, the heightened state of being in which a human claims for herself the abilities that were once normal to everyone in our Aryan tribes. Sadly, in this darkened age, after many centuries of intentionally and ill-advisedly crossing our fair bloodlines in conquest, jealousy, sell-outs and disrespect, our lines have so weakened and diluted that our natural folkish abilities once integral to the everyday lives of everyone in our three scattered racial tribes, also are now considered 'paranormal'. And still "they" persecute the reputations of our noble Folk who understood and wisely taught openly the importance of intelligently upgrading our own bloodlines and renewing our pure Folkish understandings and values again within our own borders. I am Carman Guiseppi, a student of the Runes, the sacred practices, music, and the Seiðr. Vidar's primeval forests are secure and appreciated. It is the most satisfying work, when practical help to our survival is identical with soul-purpose type work. * Sun Schutz means literally protection of the Sun. Can anyone imagine how evil it is to permit outlawing the sunshine reminders . . .
to exterminate Folk and their ancient cultures grounded in this beautiful natural real world ?